The Presbyterian Church, rooted in Calvinist theology, was founded by sixteenth-century Scottish reformer John Knox. The first Presbyterian minister to conduct services in North Carolina was Francis Makemie, who is regarded as the father of the Presbyterian Church in America. Makemie arrived in the colonies in 1683 and before his death in 1708 organized numerous churches in Pennsylvania, Maryland, and Virginia. Makemie made his home on the Eastern Shore of Virginia and on his travels preached in most of the American colonies, including North Carolina. Immigrants from Ireland, Scotland, and Wales who began arriving in North Carolina in the 1730s and 1740s organized the first Presbyterian congregations in the colony. The first Scotch-Irish immigrants settled in present-day Duplin, Pender, and New Hanover Counties in the 1730s. A few hundred colonists from Ulster settled on the lands of Henry McCulloh and Arthur Dobbs in Duplin County and formed the nucleus of the Grove Church approximately three miles southwest of present-day Kenansville. Presbyterians from Wales settled in what is now Pender County and eventually formed the Rockfish congregation near Wallace. The larger migration of Scotch-Irish via the Great Wagon Road began coming into the backcountry in the 1740s. The earliest congregations in old Orange County included Hawfields, Eno, Little River, Redhouse, Hyco Red House, Bethesda, and Grier's. The Buffalo and Alamance churches in present-day Guilford County and the Speedwell Church in what is now Rockingham County were organized by 1764. In addition, at least 13 congregations had been organized along the tributaries of the Yadkin and Catawba Rivers before 1770. There were three meeting places in Rowan County: Fourth Creek, now the First Presbyterian Church of Statesville; Cathey's Meeting House, later Thyatira; and Osborne's Meeting House or Centre. In the part of Anson County that was set off as Mecklenburg County in 1763, Steele Creek, Goshen, Sugaw Creek, Rocky River, Coddle Creek, Unity, Hopewell, Philadelphia, and Providence congregations were formed. Poplar Tent congregation was centered west of present-day Concord in Cabarrus County. The Highland Scots who settled on the Cape Fear River around Cross Creek brought their Presbyterian faith with them to North Carolina. However, many of the first settlers in the Cape Fear Valley were Scotch-Irish. James Campbell, the first regular minister, was called in 1758 to the three congregations in the Highland settlement. He preached twice each Sunday, first in Gaelic and then in English. Governing authority in the Presbyterian Church is divided between church sessions and higher "courts"-presbyteries, synods, and a general assembly. In 1741 the Presbyterian Church was divided by issues growing out of the Great Awakening. The Synod of Philadelphia or the "Old Side" opposed the revival and generally did not ordain anyone who had not been educated in a Scottish university. The "New Lights" or the "New Side" Synod of New York emphasized the more emotional approach to the faith and were willing to ordain ministers who had received a "private education" by studying under another minister. Although the two synods were reunited in 1758, the debate over these matters remained an issue in the early church. The first North Carolina congregations, which were organized during this period of internal division, were most often served by New Side clergy trained in the American colonies. The first New Side ministers in North Carolina became members of Hanover Presbytery in Virginia. In March 1770 the six ministers who were serving churches in North Carolina requested that the Carolina churches be organized as a separate presbytery. The following May the synod created Orange Presbytery (so named because two of the ministers lived in Orange County), which included all of the congregations in the Carolinas. A South Carolina Presbytery was set off from Orange in 1784, and in 1785 the synod created Abingdon Presbytery, consisting of all of the churches west of the Appalachian Mountains. The General Assembly set off the two Carolina presbyteries and Abingdon as the Synod of the Carolinas in 1788, and in 1813 it established a Synod of North Carolina. In 1996 the Synod of North Carolina included eight presbyteries east of the Appalachian divide. The western portion of the state is a part of the Synod of Appalachia. Disagreement over church government and doctrine led to a division between the "old school" and "new school" Presbyterians in 1837; the great majority of southern congregations were within the old school, which stressed biblical inerrancy. In December 1861 commissioners from 47 old school presbyteries, including those in North Carolina, met in Augusta, Ga., and organized the Presbyterian Church in the Confederate States of America. In 1864 the new school United Synod of the South was absorbed into the Southern Presbyterian Church, which, following the Civil War, took the title of Presbyterian Church in the United States. Not until 1983 did the Presbyterian Church in the United States (or Southern Presbyterian Church) unite with the United Presbyterian Church in the U.S.A. (or Northern Presbyterian Church); the resulting Presbyterian Church U.S.A. represents the largest body of Presbyterians in North Carolina, with more than 200,000 members in the early 2000s. Other Presbyterian groups with relatively large congregations in North Carolina are the Associated Reformed Presbyterian Church, the Presbyterian Church in America (about 74 churches and over 17,000 communicants), and the Evangelical Presbyterian Church. 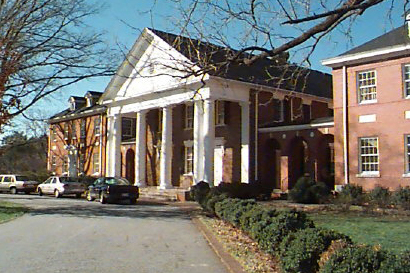 St. Andrews Presbyterian College in Laurinburg continues to be affiliated with the Presbyterian Church and supported by individual North Carolina congregations. Lefferts A. Loetscher, A Brief History of Presbyterians (3rd ed., 1978). Robert Hamlin Stone, A History of Orange Presbytery, 1770-1970 (1970). Ernest Trice Thompson, Presbyterians in the South (3 vols., 1963-73). George Wesley Troxler, "The Establishment of Presbyterianism in North Carolina" (M.A. Thesis, UNC-Chapel Hill, 1966). Francis Makemie. Image courtesy of the Presbyterian Historical Society. Buffalo Church, Greensboro. Image courtesy of NC Historical Markers (J-33), North Carolina Office of Archives & History. Available from http://www.ncmarkers.com/Markers.aspx?sp=search&k=Markers&sv=J-33 (accessed June 7, 2012).